Among the various pests and diseases that damage crops, plant parasitic nematodes present a formidable pest problem for different crops. Most species attack and feed on plant roots and underground plant parts. However, a few species attack the aerial plant parts also. Role of plant parasitic nematodes in agricultural production has remained underestimated due to their soil-borne nature, microscopic size, hidden mode of life and non-typical insidious feeding symptoms on the plants. The enormous economic damage to plants by their root feeding and interactions with other organisms renders the plants further vulnerable to other biotic and abiotic stresses. In view of damage potential of these tiny hidden enemies of crop plants, an urgent need was felt for initiating coordinated efforts at national level pertaining to nematode distribution, assessment of crop losses and for developing nematode management technologies. Therefore, the Department of Science and Technology, Government of India, initially launched the "All India Coordinated Research Project (AICRP) on nematode pests and their control" w.e.f. April 1, 1977 with 11 centers besides a Coordinating Cell at the Division of Nematology, I.A.R.I. Indian Council of Agricultural Research took it up w.e.f. April 1, 1979 as a Plan project. The title of the project was modified during VII Five Year Plan as "AICRP on Plant Parasitic Nematodes with Integrated Approach for their Control". The Project Coordinating Cell functions from Division of Nematology, I.A.R.I. Presently, the project has 18 cooperating centers located at different agro-climatic zones. These are - Anand Agricultural University, Anand; Assam Agricultural University, Jorhat; Bidhan Chandra Krishi Vishwavidyalaya, Kalyani; Choudhary Charan Singh Haryana Agricultural University, Hisar; Chandra Shekhar Azad University of Agriculture & Technology, Kanpur; Choudhary Shravan Kumar Himachal Pradesh Krishi Vishwa Vidyalaya, Palampur; Jawahar Lal Nehru Krishi Vishwa Vidayalaya, Jabalpur; Kerala Agricultural University, Vellayani; Maharana Pratap University of Agriculture & Technology, Udaipur; Mahatma Phule Krishi Vishwavidyalaya, Rahuri; Orissa University of Agriculture & Technology, Bhubaneswar, Tamil Nadu Agricultural University, Coimbatore; and University of Agricultural Sciences, Bengaluru. Five new centers were added during XII Plan, these are – Sardar Vallabhbhai Patel University of Agriculture & technology, Meerut; University of Agricultural & Horticultural Sciences, Shivamogga; Sri Karan University of Agriculture, Jobner; Central Agricultural University, Imphal; and National Institute of Biotic Stress Management, Raipur. One voluntary center – Indian Statistical Institute, Kolkata was added subsequently. Addition of some more voluntary centers is on the anvil. To organize co-ordinated trials for developing technologies towards reducing crop losses caused by nematodes. To demonstrate the nematode management technologies through on-farm trials. To prepare state-wise distribution maps of nematodes and undertake pest risk analysis for major nematode pests in Indian Agriculture. To document crop losses and develop nematode management technologies in irrigated and rain-fed cropping systems. 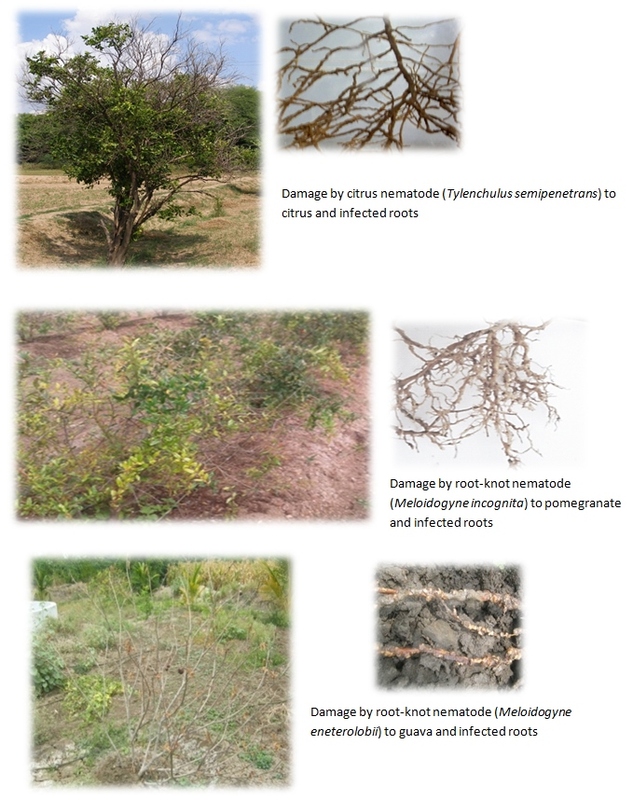 Multi-location on farm testing of nematode management options for root-knot, reniform, cyst, lesion, citrus, foliar and burrowing nematodes. To determine sources of resistance and develop nematode resistant cultivars. To update the knowledge of scientists through specialized short-term training programmes. Demonstration of nematode management technology in rice, vegetables, pulses and oilseeds. Video-documentation of nematode damage symptoms, biology and management technology. 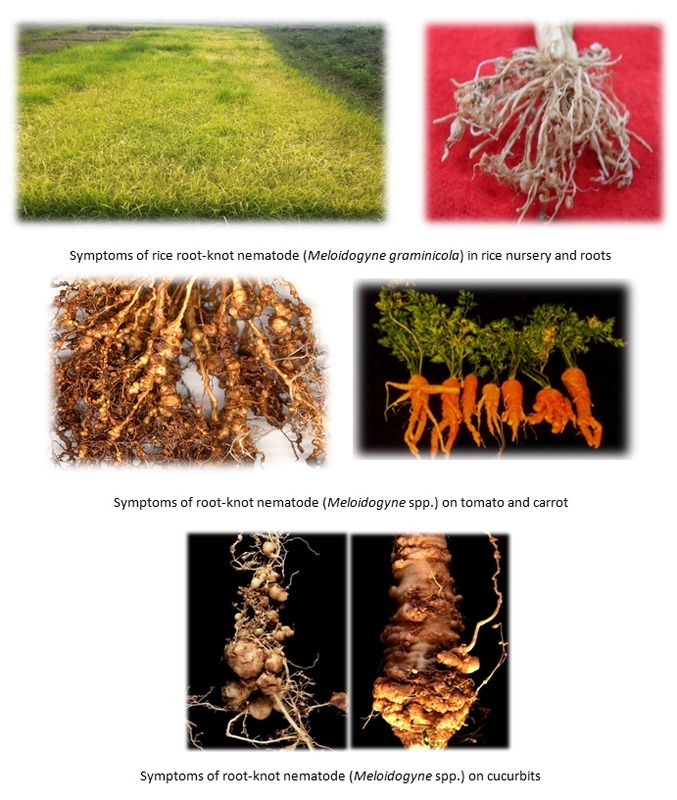 Annual loss in 24 crops due to economically important nematodes was estimated to the tune of Rs. 21068 million per annum. A "Nematode Distribution Atlas" has been published in 2010. More than 16,000 germplasm, accessions/varieties of rice, pulses, vegetables, cotton, groundnut, citrus, grapevine etc. have been screened for resistance against key nematode pests and a "Technical Bulletin on Nematode Resistance in Agri-Horticultural Crops" has been prepared. Inclusion of non-hosts/resistant varieties (viz., garlic, onion, Hisar Lalit variety of Tomato, Sreebhadra of Sweet Potato etc.) in vegetable based cropping systems has led to reduction in population of root-knot nematodes and enhancement of crop yields. Low cost eco-friendly and practically feasible INM technologies developed, demonstrated at farmers’ fields and some of them included in package of practices of SAUs. Soil solarisation of the nursery beds with 25 micron polythene sheet for 15 days during May/June (transplanted rice) along with carbofuran (soil application) 1 kg a.i./ha at 45 DAT was most effective against rice root-knot nematode, Meloidogyne gramnicola. Soil application with Paecilomyces lilacinus @ 2.5 kg/ha at sowing significantly reduced the population of reniform nematode infecting soybean. Use of local strain of Pseudomonas fluorescens has given promising results in the management of Meloidogyne incognita as well as Sclerotium rolfsii on soybean. Trichoderma harzianum @ 25 kg/ha along with Pochonia chlamydosporia @ 10 kg/ha one week prior to sowing effectively managed lesion nematode, Pratylenchus thornei and Fusarium species in chickpea. The effectiveness of Pseudomonas fluorescens in castor as soil application @ 2.5 kg/ha in the management of Rotylenchulus reniformis was confirmed. Metham sodium @ 30 ml/m2 applied 15 days prior to transplanting gave highest control of root knot nematode in tomato under protected conditions. Tomato varieties/hybrids namely Regy and Moscotel 74-101 were found resistant to Meloidogyne incognita in polyhouse condition. Combined application of Neem cake @ 100 g/m2 + Paecilomyces.lilacinus @ 50 g/m2 has been found most effective in reducing the Meloidogyne incognita population in soil and also increasing the yield of cucumber grown in polyhouses. Soil application of Pseudomonas fluorescens @ 20 g/m2 and paring with hot water treatment at 55° C + Carbofuran @ 0.5 g a.i./plant + neem cake @ 1 kg/plant proved effective in reducing the root-knot nematode population and increasing the yield of banana cv. Grand Naine. Use of Paecilomyces lilacinus @ 20 kg/tree + Castor cake @ 2 ton/ha in root zone of pomegranate at regular interval of six months reduced the root-knot nematode population below economic threshold level. Role of cropping systems and soil fertility on community structure, biodiversity and population dynamics on plant parasitic as well as other soil inhabiting nematodes under different agro-climatic conditions of the country has been investigated. Pest risk analysis for major nematode pests in Indian agriculture has been investigated. Sequencing of root-knot nematode populations for confirmation of species are in progress. Software for computing community analysis of nematode populations has been developed. 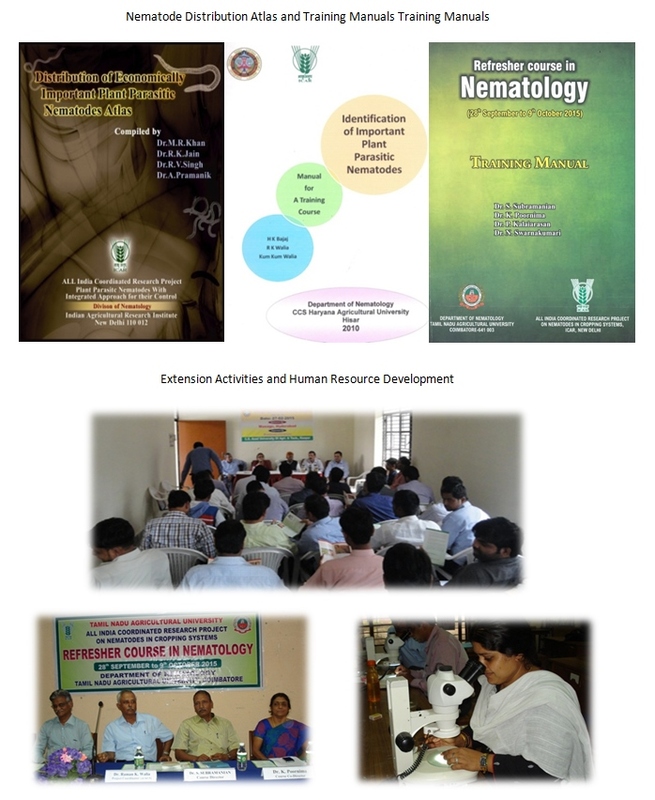 IPM involving nematode management in participatory approach of multi-stakeholders has been taken up in collaboration with NCIPM in rice against Meloidogyne graminicola at UAS, Bengaluru and AAU, Jorhat and against M. arenaria infecting groundnut in Junagarh (Gujarat). Under protected cultivation, root-knot nematode has been identified as one of the major constraints throughout the country. Linkages with IIHR and NBAII, Bengaluru for multi-locational testing of bio-agents developed by them at different cooperating centers of AICRP (Nematodes) has been initiated. Nursery bed treatment with carbofuran (Furadan 3G) @ 0.3 g a.i./m2 followed by field application of carbofuran @ 1 kg a.i./ha 40 days after transplanting for the management of root-knot nematode (Meloidogyne graminicola) and rice root nematode (Hirschmanniella oryzae). Hot water treatment of rice seeds for 10 min at 50-55° C followed by foliar spray with carbosulfan @ 0.1% 40 days after transplanting against white tip nematode (Aphelenchoides besseyi). Soil solarization of nursery beds with a thin transparent polythene sheet (50-100 µm) for 15 days during summer and application of carbofuran @ 3.3 g /m2 before sowing followed by root dip treatment of transplantable seedlings of vegetable crops with carbosulfan @ 500 ppm at transplanting in the main field for the management of root-knot nematode (Meloidogyne spp.) in tomato, brinjal and chillies. Deep summer ploughing in states having hot and dry summers for the management of root-knot nematodes. Solarization of nematode infested field + seed dressing of direct sown crops with carbosulfan 25 DS @ 3% a.i. (w/w) in mung bean, cowpea, black gram, okra, cucurbits for the management of root-knot (Meloidogyne spp. ), reniform (Rotylenchulus reniformis) and lesion nematodes (Pratylenchus spp.). Use of bioagents viz., Pseudomonas fluorescens, Trichoderma viride @ 10 g/kg seed for the management of root-knot (Meloidogyne spp.) and pigeon pea cyst (Heterodera cajani) nematodes in pulse crops. Chickpea seed treatment with neem seed kernel powder @ 10% w/w or Trichoderma viride @ 10 g/kg seed for the management of root lesion nematode (Pratylenchus thornei). Use of organic amendments including neem and castor cakes @ 1 t/ha for the management of root-knot nematode (Meloidogyne spp.) in vegetables and groundnut. Their combinations with seed treatment with carbosulfan 25 DS @ 3% a.i. (w/w) further improved efficacy in reducing nematode populations. Use of neem cake @ 1 t/ha + neem oil @ 5 l/ha and carbofuran @ 1 kg a.i./ha for the management of root-knot nematode in groundnut. Seed dressing with PGPR (Gluconoacetobacter diazotrophicus strain 35-47) along with soil application of carbofuran @ 1 kg a.i./ha against root-knot nematode (Meloidogyne incognita). Paring and hot water treatment of banana suckers at 55° C for 20 min combined with application of neem cake @ 1 kg /plant and carbofuran @ 16.6 g/plant in the pit before planting against nematode disease complex. A number of trainings for the farmers, scientists and field officers of the State Department of Agricultural have been organized. Video documentaries on nematode symptoms and their management have been prepared for the benefit of farmers. Farmer-friendly publications in different regional languages have been published and nematode awareness days (Nematode Chetna Diwas) were organized to create awareness among the farmers and extension officers regarding nematode problems of crops and their management. Organization of short-term training programmes in Nematology. Organization of national campaign and countrywide public awareness drive against key nematode problems of the country. Web-based state-wise distribution maps of agriculturally important nematode fauna in the country. Impact of economically important plant parasitic nematode populations on crop health. Population dynamics of economically important nematode pests under different cropping systems and role of cropping systems in nematode management. Identification and development of nematode resistant cultivars. Front line demonstrations at farmers' fields to demonstrate and validate the most effective low cost, eco-friendly nematode management technologies generated in the project. Designing nematode management technologies for organic farming systems. Pest risk analysis to address phytosanitary needs against plant parasitic nematodes under WTO regime of international trade in agricultural commodities. Carry out researches on use of indigenous microorganisms for their antagonistic role against plant parasitic nematodes. 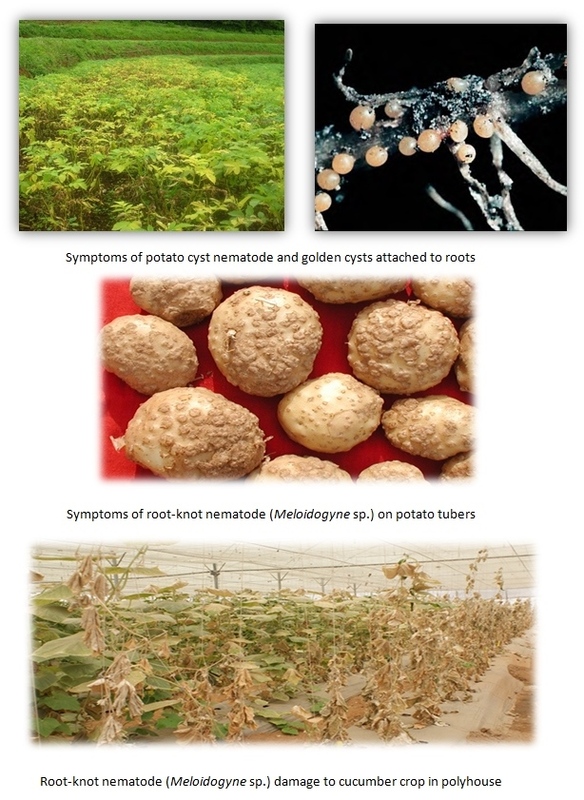 Nematode problems and their management in protected agri- horticultural crops. Development of a national nematode diagnostic facility based on morphological and molecular characterization of nematodes. The project has linkages with National Centre for Integrated Pest Management, New Delhi; Indian Institute of Farming Systems Research, Modipuram; National Bureau of Plant Genetic Resources, New Delhi; National Bureau of Agriculturally Important Insects, Bengaluru; Indian Institute of Horticultural Research, Bengaluru; All India Coordinated Research Projects on different crops and crop based Institutes of Indian Council of Agricultural Research.